Far too often I see fantastic Sci-Fi vehicles that are presented itself either on a plan backdrop or photoshopped background. 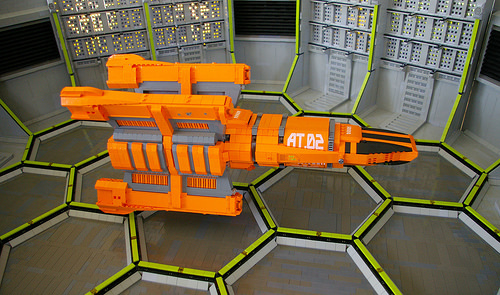 Not to be satisfied with just a great ship, Keith takes it to the next level by building a home for his ship, complete with fantastic hexagon floor (based off of Tim G’s design) and classic-Goldman back lit wall. That said, it bugged me enough to dust off my edit skills and fix it. Oh no. I no longer have edit skills. Why are you guys making fun of Keith’s coat hanger? Great hexes. Great ship. But that back lit wall – that is unquestionably the highlight for me!